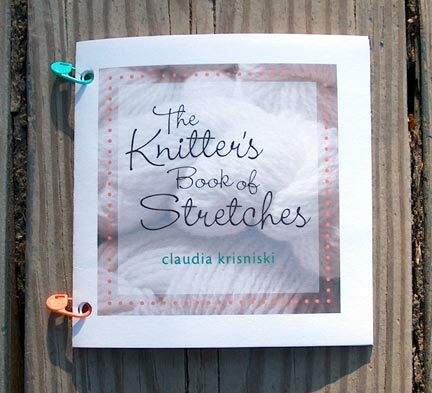 the 7 exercises in this booklet will soothe, relax and realign tired muscles after a knitting session. Please be sure to show this booklet to your health practitioner before attempting any exercise. ....for at least the past 6-9 months I was experiencing quite a lot of pain in my arm and shoulder, especially when knitting. I was taking Tylenol twice a day..... and I am not one to take anything. Since beginning the stretches at the retreat I have had no pain whatsoever, and have not taken one Tylenol!! I was sure I needed to see a doctor and was headed for PT if not surgery.....but you cured me!!!!!!! This book was written, illustrated, printed and assembled in the USA.